Printable Black & White PDF Printable Color PDF More Paper Dolls & ClothesA few months ago I asked my Patrons what they wanted to see as far as themes. Fairies blew every other option out of the water in the poll (and no one voted for cyborgs at all.. poor cyborgs). 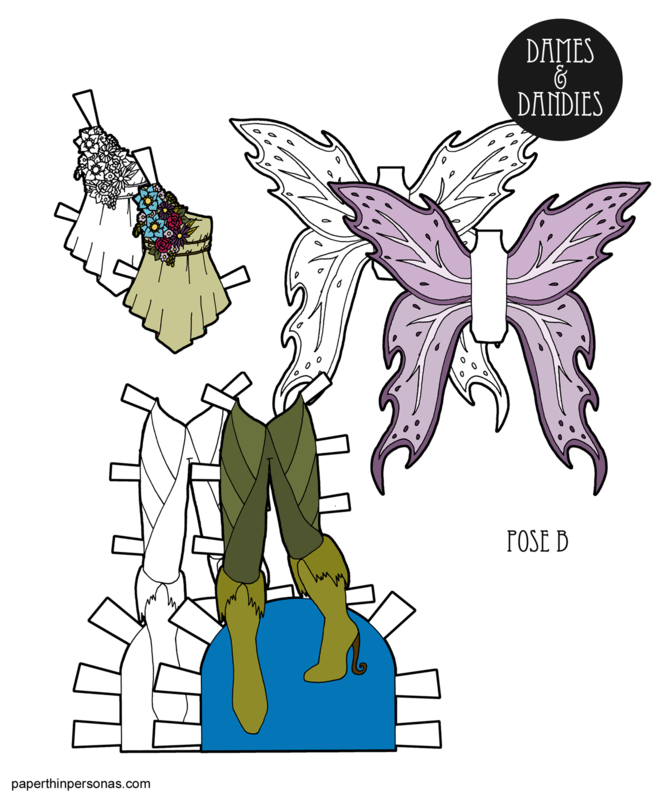 So, I decided that a set of fairy wings and fairy clothes made so much sense for the paper dolls. All right, confess, I mostly wanted to draw fairy wings. Anyway, the fairy wings are designed to glue against the back of the doll with the wings themselves free, so you can slip the tabs behind the doll’s shoulders. That way they can still wear clothing and most paper dolls I think want to be wearing clothing. I’m also super conflicted when I draw fairies. I tend to just draw like flower inspired fairies, but deep down inside I often find myself thinking of older, darker and more traditional fairies. Those fairies are not at all nice and probably weren’t wearing flowers…unless those flowers helped them lure humans to some sort of horrible doom. Anyway I haven’t drawn those fairies yet, so let’s just think of nice happy flower fairies. Much less likely to steal children or drown unwary travelers. Love the fairies? Not sure about them? Should I do more? Let me know in a comment and if you want to have a vote in the next poll, than join the Patreon group. Thank you! They were fun to draw. This looks amazing I love how you do wings! The idea of some winter court dark sidhe would be so cool. Some more adult creepy ones. Redcaps and bogwitches oh my! Dark fairies are on my list. I just haven’t gotten around to it yet.